OMG I Just Read A Book! On New Year's Eve this year I started getting sick. I had a party to attend that evening, but I had to fake being "into it" and just try to survive until midnight so as to publicly and visibly fulfill my obligation to "be happy" about it becoming 2013 and go home. On top of that, I have entered a phase of life where a number of problems have begun to weigh deeply on my conscience, many of them work- and future-related, so I have begun looking for modes of thought or physical routines which deliver an hour or two of psychic peace on those days that I am not happily distracted by the work of producing traditional architectural renderings and storyboards. In that context, it occured to me to browse the books gathering dust on my shelves and pick one out to read. I had a vague recollection of "reading" in the the pre-internet era, I was sure I could learn to do it again. I settled on a new-ish book: The Rest is Noise, by Alex Ross, and off I went, reading. Once I got through that initial block of reading entire pages at a time before realizing I hadn't retained the meaning of a single word, I found that I was reading multiple pages at a time without falling asleep! I hadn't felt promise like this in years. I caught more of a thrill the next day when I picked up the same book and realized that I had made it a quarter of the way through! Not only that, but I had learned quite a bit about Strauss, Wagner, Mahler, and the reactionary revolution in atonal music they inspired (more on this in future posts). All this simply because I was reading during the day. This reading thing was working out well. Most exciting of all, I have just started re-reading John Stilgoe's epic book (and companion to his required Harvard GSD class) about The Common American Landscape, 1525 to 1860. It looks like it's going to be as awesome as I remember it. I knocked off forty pages this morning, and I may try to sneal in another ten at lunch. Who knew there was such a thing as the Missouri Territory Earthquake of 1812? Well, just wanted you internet denizens to know that it is possible to learn paper book reading again, that I'm loving it, that I'm learning, and that it's begun reducing the amount of time I waste on the internet everyday--or at least replacing a good portion of that time with production, rather than consumption, of silly blog posts. 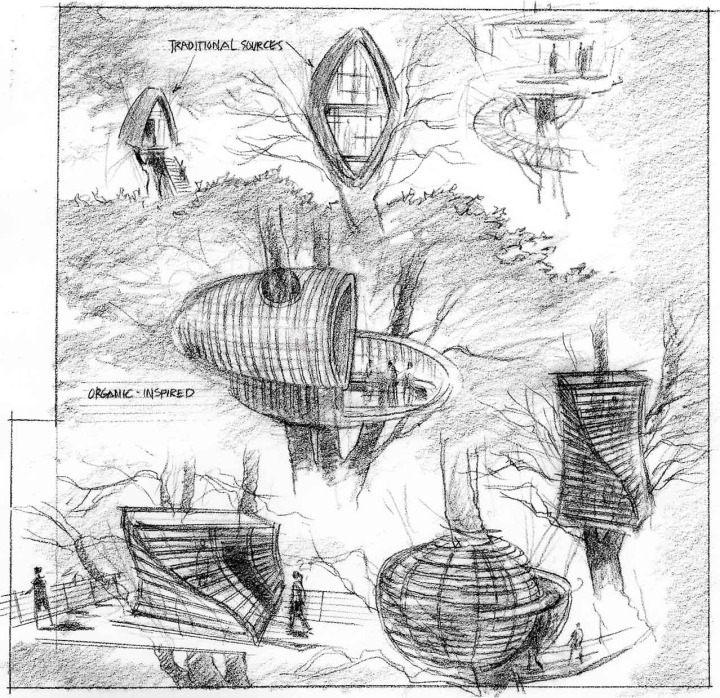 Almost forgot: hope you've enjoyed the storyboards I did for a famous NYC architect some years ago for a top-secret Disney Cruise Line project, converting a private island into a resort masquerading as the home of the mythical Hawaiian goddess Pelle. Cool, huh? And for all of you search engine crawlers scratching your algorithms, wondering what a poorly-written post about reading a book has to do with traditional architectural rendering, digital rendering, architectural illustration and architectural sketching, I don't know but it was fun. How Funny Were The Golden Globes Last Night?